Safety is important for ourselves and our loved ones. We all want each other to be safe, but sometimes unsafe circumstances creep up on us when we least expect them. How many times have you heard someone swear they were able to drive just fine when they were far too intoxicated to do so? The new revolution of the best breathalyzers are portable and easy to take with us on the go. One two-minute test could save a life. We are excited to share with you ten of the best breathalyzer brands available on the market because we believe everyone should have a compact tool such as a portable breathalyzer to ensure safety when driving. Let's take a look at the best models out there. 1. What Is a Breathalyzer? 2. What Other Types of Alcohol Testing Devices Are There? 3. Which Best Breathalyzer Model Is Right for Me? 4. Where Can I Buy the Best Breathalyzers? 5. 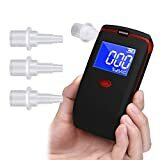 Overall Price Range of the Best Breathalyzers? We found and answered a few important questions regarding what breathalyzers are used for, what types of alcohol-testing devices are out there, and which breathalyzer models are best for your particular needs. We also included where you can buy breathalyzers for the best prices on the market and what our overall price range for our top ten list is. Breathalyzers are used to determine the BAC, or blood alcohol content of a person about to get behind the wheel. These are used by law enforcement officers, businesses, and individuals who are interested in being safe. Remember that the most common BAC average for impaired driving is 0.08% and you'd do well to remain below that if you want to be safe driving. A breathalyzer device contains a system to sample the breath of the user, two glass vials containing the chemical reaction mixture, and a system of photocells connected to a meter to measure the color change associated with the chemical reaction. The breath sample of the user is bubbled in one vial through a mixture of sulfuric acid, potassium dichromate, silver nitrate, and water. The sulfuric acid removes the alcohol from the air into a liquid solution and the alcohol reacts with the potassium dichromate to produce chromium sulfate potassium sulfate acetic acid water. Besides breathalyzers, there are also intoxilyzers, and alco-sensor III or IVs. Intoxilyzers use infrared spectroscopy to identify molecules based on the way they absorb infrared light. Since molecules are constantly vibrating, changes in vibration can be monitored as the bending and stretching of various bonds. Each bond absorbs infrared light at different wavelengths. In an intoxilyzer, a lamp generates an infrared beam, it passes through the sample chamber and is focused by a lens onto a spinning filter wheel which contains the narrow-band filters for monitoring wavelengths. An electrical pulse is relayed to the microprocessor from there. Alcosensor III or IVs use fuel cells that have two platinum electrodes with a porous acid-electrolyte material between them. As air is breathed from the user it flows past one side of the fuel cell and the platinum oxidizes any alcohol in the air to produce acetic acid, protons, and electrons. The more alcohol that becomes oxidized, the greater the electrical current. A microprocessor measures this current and calculates the BAC from there. If you want the highest accuracy you can get, we recommend a professional level breathalyzer that uses a fuel cell center technology. This is the same technology used by law enforcement, substance abuse centers, clinics, and businesses but are also popularly purchased for individuals because of their high accuracy. If you are more concerned with alcohol detection of any amount, you'll be satisfied with a semiconductor oxide unit that are often used for self-testing or testing friends and family. These are affordable and accurate readings as the quality of them are far above novelty grade. 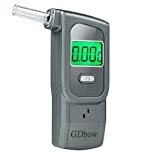 We highly recommend you look for and purchase your next breathalyzer model online at sites like Amazon. Amazon offers competitive pricing and well-organized searchable stock with testimonials from manufacturers and honest customer reviews. We included the Amazon links to each item on our top ten list so you can easily purchase the item or check it out to find more information. Breathalyzers have a wide price range depending on your specified needs. We only included models that are good prices for the budget-conscious consumers. We included the price of each item on our top ten list so you can easily decide if it's within your price range. The range for our top ten list is $17 to $40. 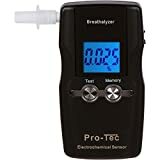 This best breathalyzer has an adjustable test rating with 6 units including %BAC-US, g/l-EU, mg/L-JP, mg/100ml-CN, 0/100BAC-RU, and 0/100prom-PL. There are caution and alarming values that can be set based on your specific needs and the breathalyzer has enough storage to keep up to 32 recent testing records you can look back on. This breathalyzer is easy to take anywhere and comes with ten extra mouthpieces you can wash and reuse or recycle. It's high-accuracy with warnings as little as 0.05% BAC and also has a feature that allows it to test breast-feeding mothers to make sure they can safely feed their babies. It's smart, easy-to-use, offers fast results, and comes with a 90-day money-back guarantee. Just like the JASTEK and GDbow models on our list, this breathalyzer can be easily customized to display any of the six most commonly used units for measuring blood-alcohol content. Its energy-saving design and easy-to-read LED screen will have you never looking elsewhere. It's been tested and confirmed as accurate and simple to use, and its designed with a low-voltage indication. This high accuracy best breathalyzer lets you know when your BAC is as small as 0.05% for ultimate safety. It comes with five mouth pieces that are placed on the back of the device, all of which can be recycled or cleaned and reused. It features a one-touch operation with your results plainly stated on a perfect LED screen. Its affordable price and compact size allow you to take it anywhere with ease. 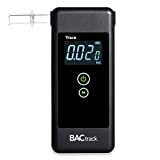 This compact on-the-go breathalyzer produces only the most accurate results with an advanced semi-conductor sensor technology; this makes the accuracy about 0.01% BAC. It's compact and lightweight only weighing 0.92 oz. and it comes with a key-chain ring. Its folding mouthpiece makes storage easy, and it comes with fice extra mouth pieces. 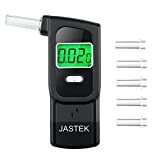 This best breathalyzer also features six commonly used units (same as the JASTEK model) and will hold up to 32 past breath records for your convenience and data comparisons. The GDbow features easy-to-understand functions and a clear LED screen that shows your results in whichever customized units you choose to show it in. These portable key-chains test your alcohol level in four steps to check your BAC. Blow air for 12 seconds and get your results in two minutes. The powder within changes color to indicate your impairment level and its small size is convenient for fitting in your pocket, purse, or glove box. There are no batteries required and these breathalyzers are cheap and reliable. The accuracy of this best breathalyzer is stunning; when the test result is over 0.05% BAC the device will emit an alarm for your safety. Its alarm is completely automatic and the compact size of the breathalyzer is perfect for taking it with you anywhere. It features an LCD display that's easy to read and it also comes along with a 100% manufacturer's guarantee. This space-saving, lightweight, easy-to-hold portable breathalyzer has a one-button easy operation and a back-lit LCD screen for a clear reading every time. Its high sensitivity and accurate reading won't have you questioning your safety when you need reliability the most. It has an advanced semi-conductor sensor to ensure accurate readout in a short amount of time. FDA 510(k) approved professional grade breathalyzer with highly accurate fuel cell sensor police grade technology. This portable 3-in-1 alcohol tester also has a torch function and a timer function. It's threaded by key-chain for maximum convenience. It has a quick response and resume capacity, an orange-lit flashlight, and colored lights tell you what your alcohol level is. The timer can count both up and down using different button combinations. 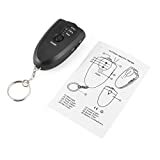 We all know safety is key no matter what our situation, and since alcohol is tricky in that it impairs our judgement, it's a good idea to carry one of these affordable compact models in your purse, pocket, or glove box in your car for safe driving. 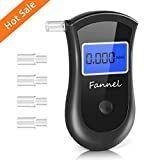 We want you to stay safe and avoid tragic accidents that shouldn't happen, so pick out your favorite portable best breathalyzer from our list and follow its Amazon link to purchase it and/or find out more information. What are you waiting for? 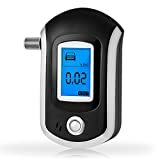 Hey Buddy!, I found this information for you: "Top 10 Best Breathalyzers To Have On Hand At Your Bar". 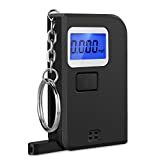 Here is the website link: https://www.duiauthority.com/keychain-breathalyzer/. Thank you.